Here it is - your motorcycle, car, and garage heaven on earth. As you look over these 145+ items that put the Harley® touch on anything with wheels and the stalls they sleep in, you’ll think you’ve arrived at that “great beyond.” Most items in these offering could be defined as "items of necessity" for the Harley-Davidson® motorcycle enthusiast. We hope you agree. What’s the need? Just scroll through the pages, and you’ll be saying, “I need that! Wow, I need that, too!” That’s why we are here, to fulfill those needs. Whether it’s for the car, the bike, or the garage, we have it. We have stickers, decals, steering wheel covers, drink holders, VRSC tool kits, license place frames, flags, jiffy stand coasters, seat covers, travel mugs, locks, valve stem covers, hitch plugs, a Harley-Davidson® Premium tool kit, shop stools, utility floor mats, Harley® logo Snap-On® tools, air compressors, drink coasters, a parts tray with magnetic base, tire pressure gauges, and so, so much more. 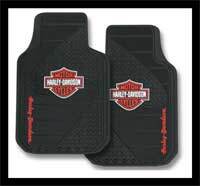 The hitch covers come in various sizes and colors. For your car, attention to detail is always a good thing, even when it comes to valve stem covers - in chrome or black. There is even a flashlight to see around the dark areas of the garage. WisconsinHarley.com is your destination for Harley-Davidson® quality tools and accessories for your car, bike, and garage.